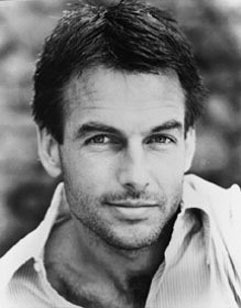 Actor Mark Harmon played Dr. Bobby Caldwell on St. Elsewhere, Dr. Jack McNeil on Chicago Hope, and detective Leroy Jethro Gibbs on NCIS. He has also played astronaut Wally Schirra, killer Ted Bundy, and legendary criminal John Dillinger. His father won the Heisman Trophy playing for the University of Michigan in 1940, then played for the Los Angeles Rams and had a long career as a sportscaster. Harmon's mother was actress Elyse Knox, who played comic strip boxer Joe Palooka's love interest in Gentleman Joe Palooka and several 1940s sequels. Harmon's grandfather, William Franklin Knox, was Secretary of the Navy from 1940-44. Matthew and Gunnar Nelson (aka Nelson, the band) are his nephews, and actress Tracy Nelson is his niece. In January 1996, two young men were driving a Jeep Cherokee at 85 mph through the residential streets of Brentwood, California. They crashed into a tree, and the Jeep flipped over and burst into flames near Harmon's home, with one of the passengers still inside. His wife, actress Pam Dawber, heard the wreck and called 911, while Harmon, according to the fire department's report, "smashed the car windows with a sledgehammer and pulled the burning boy to safety". With "aw shucks" aplomb, Harmon said he was just the guy who happened to have a sledgehammer in his garage.